As Paint + Pattern continues to celebrate the patterns and design of Africa during February, it is exciting to delve into the history of Kuba textiles and Kuba Cloth panels, made in the Democratic Republic of the Congo, formerly Zaire. This iconic African fabric features elaborate and complex design and surface decoration. 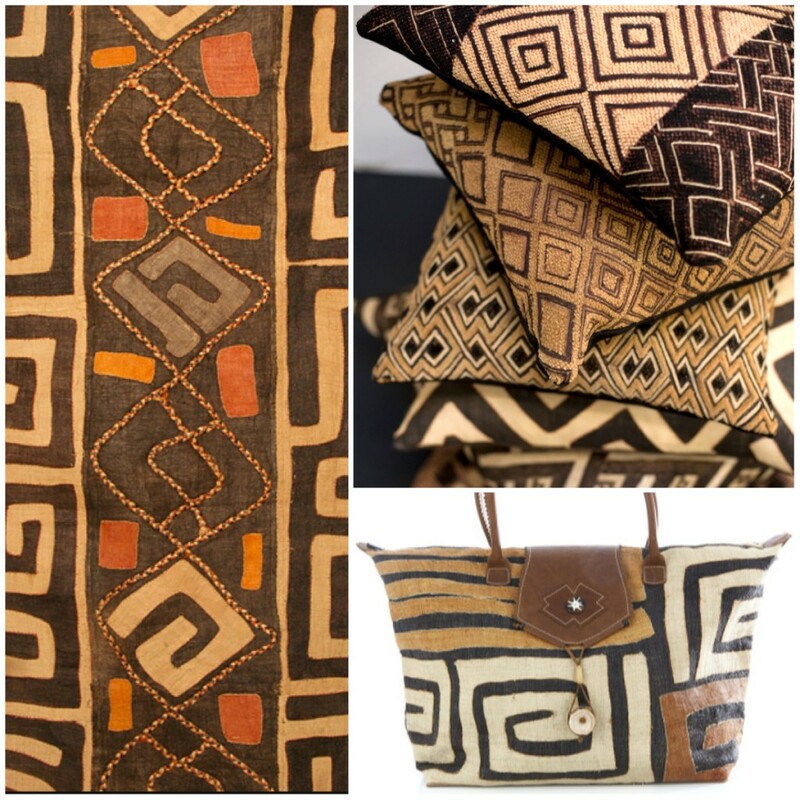 Kuba cloth is woven from raffia fibers. Production of these textiles is a multiple stage process which involves the participation of children, men and women of the same clan. They gather and prepare the fibers for weaving and embroidery. The process to create Kuba cloth involves weaving the basic cloth, dyeing the embroidery fibers, and embellishing the woven cloth with embroidery, applique, patchwork and dye. 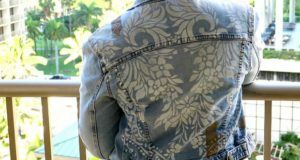 Most textiles are a variation on rectangular or square pieces of woven palm leaf fiber enhanced by geometric designs. Women are then responsible for transforming the raffia cloth into various forms of textiles, including ceremonial skirts, ‘velvet’ tribute cloths, headdresses and basketry. 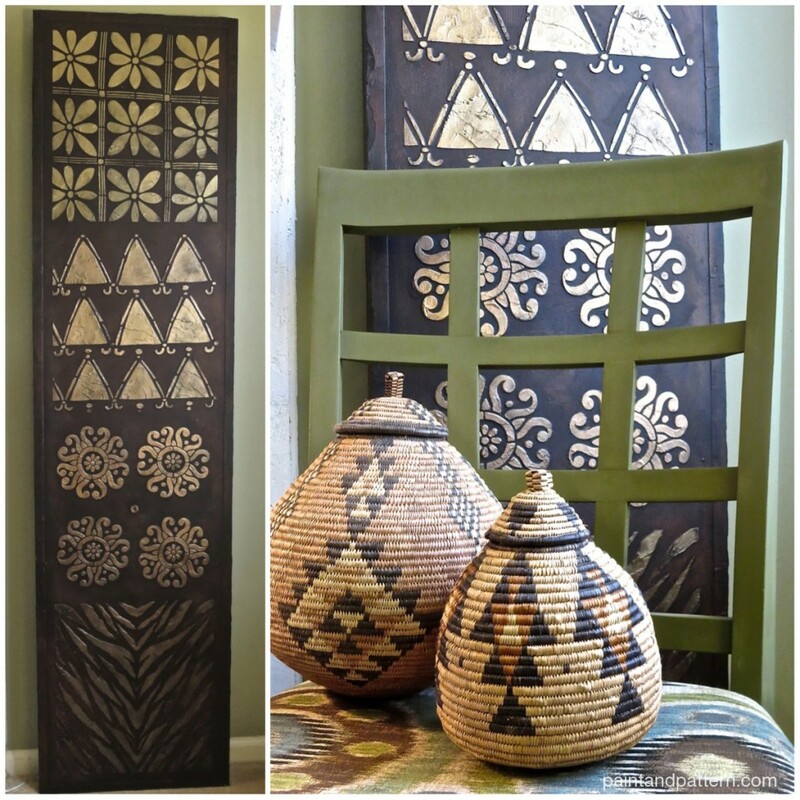 After researching Kuba cloth for this post, I was inspired to create a large art panel with a Kuba-esque feel to is using some of the many gorgeous African Stencils from Royal Design Studio. This provided the opportunity to repurpose an old door and also to incorporate an embossed stencil technique with a texture paste and stain. It’s a fun project and a great way to try your hand at a few new techniques. Step 2: Lay out your design. 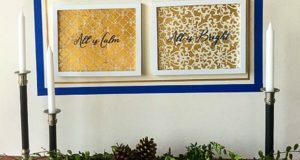 Here I used one-inch tape to create a quick border and measure off four equal sections, based on the size and scale of the stencils I had to choose from. Step 3: Tape down your first stencil and, using the palette knife pull some Wood Icing across the stencil opening. Let each section dry almost completely, then move on to the next pattern. Let dry completely. Note: I used two layers of Wood Icing to build up a higher image with the stenciling, allowing time to dry between layers. 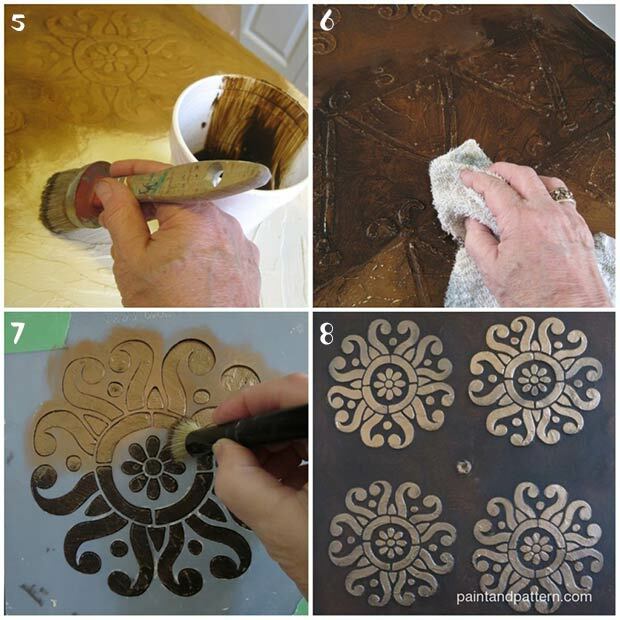 Clean your stencils immediately: scrape off excess Wood Icing, lay on heavy plastic and scrub with a small scrub brush. Rinse well. Spraying Motsenbacker’s Lift-Off #5 Latex Paint Remover on your stencil prior to cleaning will make this process even easier! Step 4: In a separate container, combine Wood Icing with about 50% water. Mix well and paint over the entire piece with a chip brush. Allow to dry. Step 5: In another container, combine Rich Brown Stain & Seal with about 50% water and mix well. Using a brush and working in sections about 12″ across, paint on the stain, feathering the edges. Wipe with a rag. Move on until the entire piece and edges are complete. Let dry about 15 minutes. Step 6: Repeat entire process using Antique Mahogany Stain and Seal. OPTIONAL Repeat using Ebony. 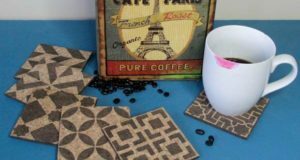 Stain and Seal looks extra beautiful when layered! Step 7: Place a clean stencil back on the original design and tape in place. Stencil each different pattern in the color or colors of your choice. To stencil, dip your stencil brush in the lid of the Stencil Creme jar, then swirl your brush onto paper towels using a hard pressure to offload excess paint. Using a swirling motion again and a light pressure on your brush, fill in the open areas of the stencil. 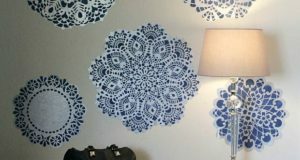 Repeat with the other stencil patterns, changing colors and brushes as needed. Clean your stencils again when done. Step 8: The final look shows a nice mottled appearance to both the textured background and raised stencil image. Now, go decorate! 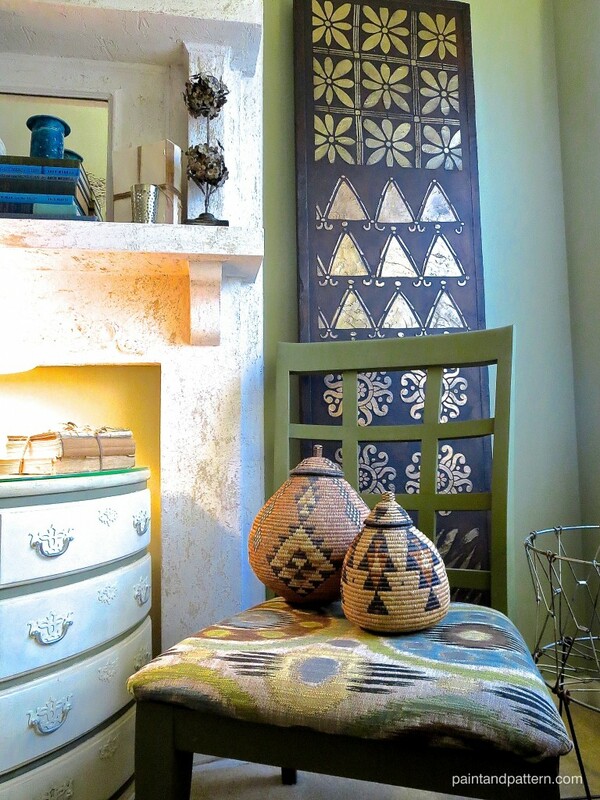 If you have some African baskets, masks or artwork, that is great. But you can make a statement with this type of art piece almost anywhere because of its graphic quality and neutral color scheme! Side Note: This is a large project that requires quite a few items. 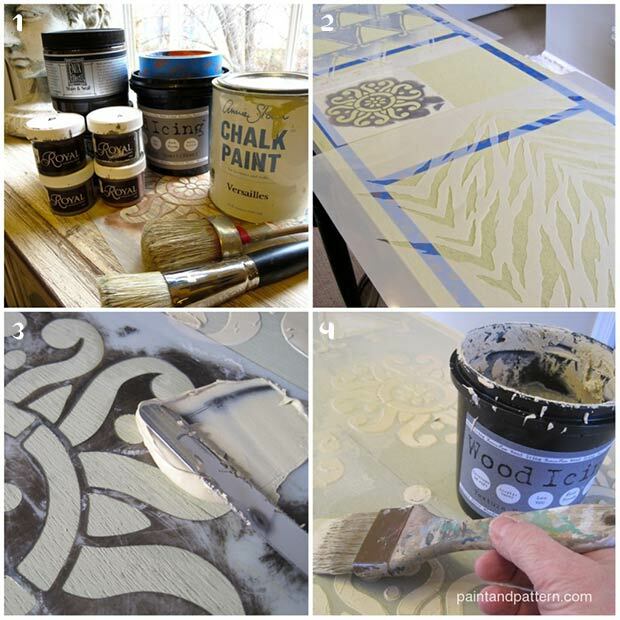 If you want to start small, just scale down to one stencil motif and a smaller panel. This is a great project for those of you “hoarders” who have lots of left-over materials hanging around. I loooove this, it’s so striking! There are some extra plain doors in our basement and was thinking of stenciling them, before I saw this! Now for sure will paint them, this big panel look is so cool. Hey Deb, this was really fun – my first experience with Wood Icing and it was very easy. Lots of ideas now. Have missed using Stain & Seal and the combo is much prettier in person. The stencil cremes add a rich touch. I love the beautiful creation. I want to soak up the beautiful ideas and make some beatiful creations.